Corey Clement only played 37 percent of the snaps, but he looked good when he was on the field. 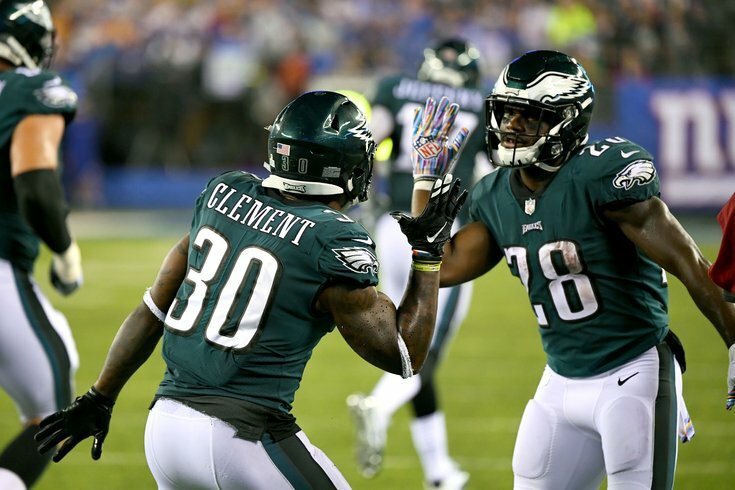 In the Philadelphia Eagles' stomping of the New York Giants Thursday night, the Birds' depth was put to the test along the offensive line, and in the secondary. As a result, we got to see some of their emergency contingency plans in a few scenarios. Here are the snap counts from that matchup. Also, congratulations to Warmack, who got on the field for the first time this season. He came in as a tight end in a jumbo package late in the game. Analysis: On Friday, Pederson said Clement was "a full go." That was obviously not true, as Erin Andrews reported pregame that Clement was "on a pitch count." He sure looked good, though. Analysis: Nitpick here, but I remain puzzled by why exactly Aiken gets snaps. Analysis: It's mildly interesting that the second-team defensive ends got more snaps than the starters. I didn't track that during the game, but the assumption here is that was a result of the big lead the Eagles amassed. Barnett got a lighter load than normal Thursday night, which is probably a good thing for him, since he was out last week with a shoulder injury. He'll have extra time now to heal up for Carolina. Analysis: Nothing surprising here, though we'll note that this is the first time Bradham played (just about) the entire game. Analysis: OK, there's a lot to unpack here. First, as we know, Maddox became the starting safety after Rodney McLeod was lost for the season, despite having no experience at safety in college. When Jones went down with a hamstring injury and was quickly ruled out, the Eagles were left with a big hole at that spot. They opted to move Maddox down into the slot, and played Douglas, another corner who didn't play safety at WVU*, at Maddox' safety spot. My takeaway here is that Jim Schwartz values the slot corner spot (when there's a slot corner on the field, anyway) more than the deep safety spot. Later, after Mills went down, Douglas moved back down to corner into Mills' spot, and Tre Sullivan came in to play safety. *Douglas says he played safety in college, though (1) there's no available game film of him doing so, (2) people who follow WVU closely say he was strictly a corner, and (3) no scouting report of him anywhere notes that he played safety. But ¯\_(ツ)_/¯. Don't @ me (seriously).